Being a fan of Marlena Stell's Makeup Geek tutorials, I was so excited when she launched the new Makeup Geek Eyeshadow range earlier this year. 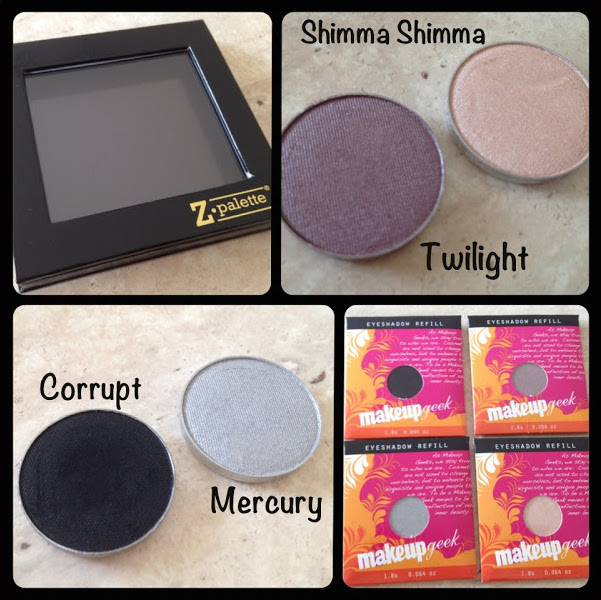 After watching Marlena's introduction video where she showed off some of the new eyeshadow colours I knew I had to get Corrupt and Shimma Shimma. After browsing the entire Makeup Geek eyeshadow collection (there are 56 colours to choose from!) I decided to purchase 2 additional colours and the Z Palette. My new Z Palette is the home for my gorgeous new Makeup Geek eyeshadows and I can honestly say these are some of the best quality eyeshadows I have ever used. Best of all they are cruelty-free! It's dark, evil, poisonous and vile. Actually, it's just an intensely pigmented black eyeshadow. Don't sparkle like a disco ball, just have some "shimma shimma" in your life. Makeup Geek says: An exclusive custom palette perfect for display and color comparison! It features a sleek and clean design that offers the strength of a plastic palette. Fold the top portion completely under the bottom portion for a space saving feature on your vanity or makeup station.This palette includes both a clear window and an open magnetic base to fit any size shadow, blush, bronzer and even some foundation.